In 1968, Arthur C. Clarke’s best-selling 2001: A Space Odyssey captivated the world—and was adapted into a now-classic film by Stanley Kubrick. Fans had to wait fourteen years for the sequel—but when it came out, it was an instant hit, winning the Hugo Award for Best Novel in 1983. Nine years after the ill-fated Discovery One mission to Jupiter, a joint Soviet-American crew travels to the planet to investigate the mysterious monolith orbiting the planet, the cause of the earlier mission’s failure—and the disappearance of David Bowman. The crew includes Heywood Floyd, the lone survivor from the previous mission, and Dr. Chandra, the creator of HAL. What they find is no less than an unsettling alien conspiracy—surrounding the evolutionary fate of indigenous life forms on Jupiter’s moon Europa, as well as that of the human species itself. A gripping continuation of the beloved Odyssey universe, 2010: Odyssey II is science-fiction storytelling at its best. Clarke is widely revered as one of the most influential science fiction writers of the 20th century, esteemed alongside Isaac Asimov and Robert Heinlein, a trio known informally as the “Big Three.” Before his death in 2008, he authored more than 100 novels, novellas, and short story collections and laid the groundwork for science fiction as we know it today. Combining scientific knowledge and visionary literary aptitude, Clarke’s work explored the implications of major scientific discoveries in astonishingly inventive and mystical settings. Clarke’s short stories and novels have won numerous Hugo and Nebula Awards, have been translated into more than 30 languages, and have sold millions of copies worldwide. Several of his books, including 2001: A Space Odyssey and 2010: Odyssey II, have been adapted into films that still stand as classic examples of the genre. Without a doubt, Arthur C. Clarke is one of the most important voices in contemporary science fiction literature. 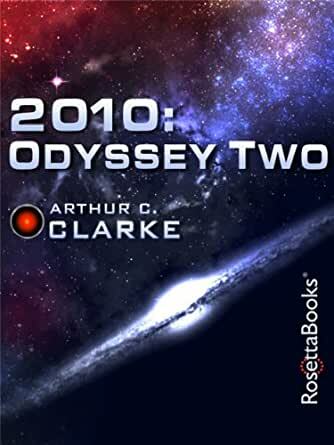 I'm happy to say that Arthur C. Clarke's "2010: Odyssey Two" is a better book than the first book in the series. The reason for this is simple: the first book is written as a descriptive novel of science and science fiction revolving around a fairly weak plot. This book is written as a true science fiction story. Some of the later (Bowman) chapters in the book are still highly descriptive in nature, but then, since Bowman is existing on his own, there's not much that can be done about that. My only real complaints with the book are that 1) there are a couple of swaths cut and pasted directly from "2001" directly into it, and 2) Clarke "revised history" by aligning the prequel events with the "2001" MOVIE instead of with the BOOK. This revisionist history isn't as bad as what Crichton did with The Lost World: A Novel (Jurassic Park Book 2) (where he brings back a thoroughly dead character because he didn't die in the movie), but still, the change of location from Saturn to Jupiter is a bit noticeable. Even so, these negatives are not huge. Thus, I'm happy to rate this book at a Very Good 4 stars out of 5. Arthur C. Clarke’s 2010: Odyssey Two is odd in that it is a closer sequel for the film 2001: A Space Odyssey rather than the original book. One thing 2010 does is give us quite a bit of back story as to what happened in the previous book, so it is possible to follow this book without having read 2001: A Space Odyssey (you may miss out on a great book, though). Set nine years after Discovery One’s ill-fated mission, 2010 involves Dr. Heywood Floyd joining a group of Russians on board the Soviet craft Leonov. Their objectives are to discover what happened to Discovery One pilot Dave Bowman, investigate the mysterious monolith from the previous book, and identify what went wrong on the first mission. It was going to be difficult for Clarke to replicate 2001, which, in my humble opinion, is a classic and superb sci-fi novel. It leaves you wondering and thinking about the vastness of the unknown. How often do sequels crush the memory of a great first book or film? Too often. That being said, 2010 was a decent successor to the first book despite its flaws. 2010 fails to capture and match up with the wonder, awe and mystery that was 2001. Where 2001 leaves some ambiguity to one’s imagination, 2010 often readily answers and reveals too much, which lessens the experience a tad. Also, I thought the politics thrown into the mix was a bit unnecessary, and maybe a little forced. 2010 could have been a finishing touch to this series, but obviously there are two more books that continue this plot going. I’m sort of interested in reading the next book, although it has been given quite a few negative marks. Not sure if I should leave well enough alone. 5.0 颗星，最多 5 颗星Still as excellent as when I was a teen. What more can be said about Clarke that hasn't already been said, particularly about one of his more famous series. Seeking the escape of an old friend, I recently re-read this story and it was still just as enjoyable as when I read it as a teen. It is fascinating now, however, to realise the prescience Clarke displayed about future events and technologies. An excellent sequel to 2001.